Completed in 2017, she is a modern take on the classic wooden yacht. Named after the giant Sequoia tree, one of the oldest living organisms on earth, this handcrafted yacht was designed as an heirloom, for generations to come. Using traditional, Indonesian Bugis boat construction comprised of ironwood and teak. Sequoia is made with a state-of-the-art American engine and electrical systems. Designed with an emphasis on space, privacy and comfort, Sequoia features three deluxe bedrooms with en-suite bathrooms, a spacious great room, sky deck, and gourmet kitchen. Custom-designed light fixtures illuminate the night sky, as well as underwater lighting to see the magical sea below. 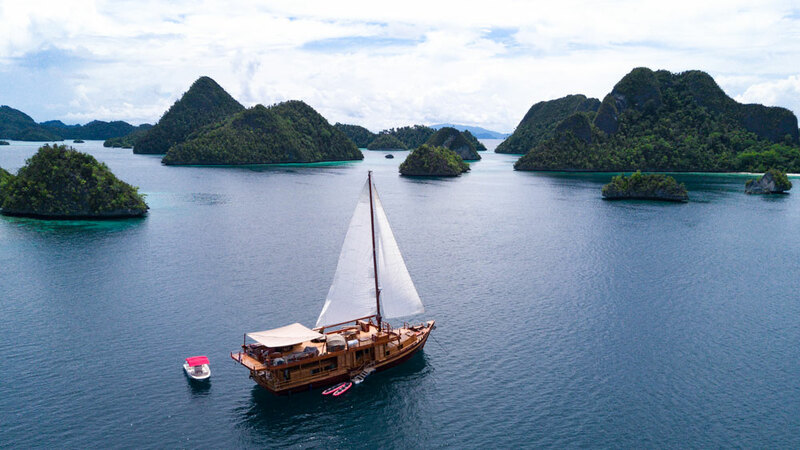 Here, east meets west with modern, custom-made amenities, melded with an Indonesian tropical island style designed to make you feel like home.